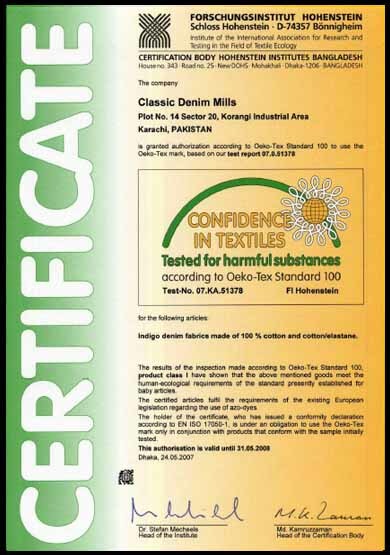 In the year of 2003 ,Classic Denim Mills (Pvt) Ltd. which has always aimed to be qualified , effective and reliable was established to manufacture the best quality products and good service in the sector by a group of success lover , friendly united, young, dynamic and capable of the presenting the best quality to their customer as a professional team and modernist machinery and has taken a respectful and exceptional place with its quality products soon both in domestic and foreign markets. has aimed to produce better of the best all the time since it was established and has already proved it with Classic QUALITY. This justifiable pride has been proved by applying innovative techniques and system all the time, considering quality as a part of main production life and satisfying its customers as well. CLASSIC DENIM MILLS (Pvt) Ltd. is a prestigious project, which was founded after undertaking deep market study of denim and denim products. Our goal is to serve the existing denim trends by innovation and creation of new trends/products to compliment the market. With our expertise and with state-of-art machinery, we are making major inroads in the international denim market. This can be attributed to the high quality standards observed and practiced by the company. Our AIM is to Supplying high quality products with competitive price to the customers, offer them the best services, be an active organization to give every customers high possible reliability. As Classic Denim Mills, with the help of efficient workforce, we are trying to serve our customers punctually with our quality products. Our products pass through processes like beaming, dyeing, sizing, weaving and finishing on sophisticated machinery, especially selected for these purposes from USA and Europe.